7-aminocephalosporanic acid is abbreviated as 7-ACA, white or almost white crystalline powder, 7-ACA is an important nucleus in synthesis of cephalosporin antibiotics, in the nucleus 7 and 3 chemical transformation can be used to prepare many cephalosporins: cefazolin sodium , cefotaxime sodium, ceftriaxone sodium, cefoperazone sodium, sodium ceftazidime, cefuroxime sodium. Cephalosporin antibiotics (Cephalosporins) are a cluster of broad-spectrum semisynthetic antibiotics, they all contain the nucleus of 7-aminocephalosporanic acid (7-ACA) , with different groups in the 3 and 7 carbon atoms, forming various cephalosporins with different antibacterial activity and pharmacokinetic characteristics. Cephalosporin antibiotics have broad antibacterial spectrum,strong antibacterial effect, and fewer allergic reactions, and only part of the cross allergic with penicillin and they have varying degrees of stability on the β-lactamase . Cephalosporins have fast development, and many families, they are divided into four generation cephalosporins according to the anti-microbial dynamic "generations" . They are the same as penicillin, cephalosporins contain β lactam ring , which is necessary to achieve antibacterial efficacy. But penicillins are 6-amino penicillin acid (6-aminopenicillanic acid, 6-APA) derivatives, and cephalosporins nucleus is 7-aminocephalosporanic acid (7-aminocephalosporamic acid, 7-ACA), the latter is from cephalosporin C, it is a fermentation product of Cephalosporium acremonium. 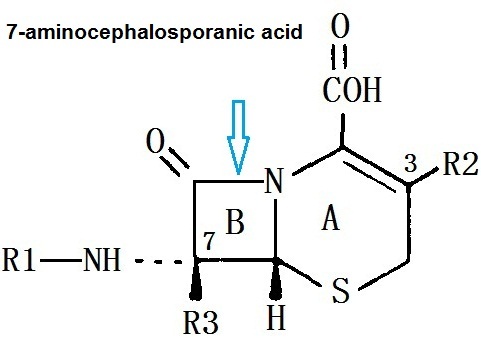 7-aminocephalosporanic acid has a dihydro-thiazine ring (A) and aβ-lactam ring (B), it has a resistant effect on the class of staphylococcus aureus penicillinase. Modifying this nucleus with different side chains can form the entire series of cephalosporin antibiotics. Modifying β-lactam bit 7 (R1), can make antimicrobial efficacy and stability within the β-lactamase change. At 3 bit on-dihydro-thiazine ring substitution (R2), the influence of effect on drug metabolism and pharmacokinetic properties is more staggering than that of antibacterial effect. Cephamycins are associated with cephalosporin C in chemical structure, the main difference is that they have a 7-α-methoxy group (R3), so that the stability to certain β-lactamase is improved . Cephalosporin is a derivative cephalosporin C which is produced by Streptomyces . Cefotetan is an semi-synthetic derivative of organic mycin G , it is a product of Streptomyces organonensis. Cefmetazole is a semi-synthetic product of 7-aminocephalosporanic acid. 6-aminopenicillanic acid (6-APA), 7-aminocephalosporanic acid (7-ACA), 3-ammonia Ji Nuoka adriamycin (3-ANA), and 3-amino-acid mono-(3-AMA)are important raw materials of the semi-synthetic β-lactam. In the β-lactam antibiotics mean antibiotics that molecules contain β lactam ring (β-lact-am), including penicillins, cephalosporins, monocyclic beta-lactam antibiotics and the like. Such antibiotics have antibacterial action, the β-lactam portion is similar to D-alanyl-D-alanine terminus of the bacterial cell wall peptidoglycan,they can be combined with endopeptidase activity center, so that the GGT sticky peptidase-catalyzed cross-linking reaction can not be completed, thereby cell wall synthesis is inhibited . As these antibiotics act not only on the cell walls of bacteria, but also interfere with cell wall formation which occurs in the final stages of biosynthesis, so they show unique selectivity on bacteria , there is almost no damage to animal cells which do not have the cell wall ,they are a class of relatively good chemotherapeutic drugs. β-lactam antibiotics are susceptible to β-lactamase destruction which leads to deactivation of them. Some β lactams are β-lactamase (β-lactamase) inhibitors, in combination with the β-lactam antibiotics, the antibiotics can be protected or less destroyed by them , they are important adjuncts to chemotherapy. Pharmaceutical intermediates. It is the starting material of many semi-synthetic cephalosporin. A variety of semi-synthetic cephalosporin industrial production is through fermentation to obtain cephalosporin C. Then obtain nucleus 7-ACA through chemical cleavage , and then the preparation is fininshed in chemically modified way . Starting from the basic raw material of semi-synthetic cephalosporin-cephalosporin C, after esterification with trimethylchlorosilane , and then by phosphorus pentachloride chloride, and Butanol etherifying, and the production is obtained finally through hydrolysis. Yield from cephalosporin C sodium to 7-ACA is about 50%.